Using chemicals is also possible, but this is for the extreme lawn enthusiast or a golf course professional. It’s done by mixing Primo Maxx and Proxy. My personal preference is just to mow it low and often. I enjoy the exercise of mowing so I don’t have a problem with it! You want to put crabgrass preventer down before crabgrass has a chance to germinate. Some will say to use a “GDD Tracker” or Growing Degree Day tracker to track the soil temperatures. Others will say to use a soil temperature probe. It’s actually easier than that. Just look for a forsynthia starting to bloom. 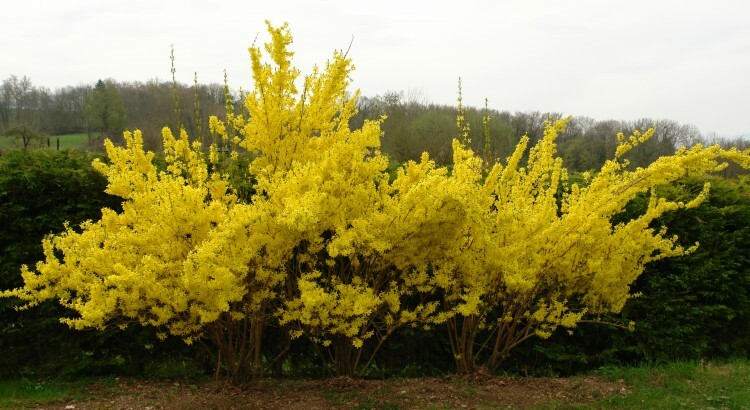 It’s those bright yellow bushes that are hard to miss (pictured above). When that happens, it’s actually the perfect time to put down crabgrass pre-emergence. What if I am too early or late? If you are early, that’s a good thing. Most preventers last months so it’s better to be early than late. It’s actually not the end of the world if you don’t do it right away. You should still put it down as soon as possible because all the crabgrass doesn’t germinate at the same time. Crabgrass preventer also prevents many other weeds so you want to get it down asap. When the snow starts to melt away and the weather starts getting warmer, we all want to run out and start cleaning up the lawn. The first thing you’ll want to do is repair any damage that plows have made from clearing the snow all winter long. If you’re unlucky you may find damage to your lawn sprinklers. If you cannot fix them yourself, don’t wait – call a sprinkler repair company as soon as possible. You don’t want to be last on their list in the middle of summer because you delayed! This is also the perfect time to remove as much salt/sand as you can. Depending on how much there is you may want to use a blower, rake, or even a heavy work broom. I prefer to do this when the grass has thawed but the soil is still frozen. This makes it easier to only broom out the sand/salt mixture and not your good soil. Any kind of debris on your lawn can delay the grass from starting to come out of dormancy. You want all that sunlight to hit the grass, not dead branches. It’s also good to give the lawn a good raking to remove any leaves, dead grass, or thatch. For best results rake in a north/south direction and then again in an east/west direction. Snow mold can be horrifying, but after a harsh winter in 2014 I survived the worst snow mold I’ve ever seen by lightly raking the affected grass off the ground. It’s important to not vigorously rake this grass as it will damage it completely. The light raking action is only to fluff up the grass to allow good air circulation around the grass. If you do this as soon as possible your lawn will bounce back. If you let the grass lay matted down and wet it could completely kill that patch of lawn. When the snow melts away the lawn is saturated and soft. Using a lawn roller you can effectively smooth out your lawn with much less effort than at any other time of the year. Lightly adding in soil to fix any dips is also a good idea. Just apply small amounts at a time so the existing grass isn’t smothered. 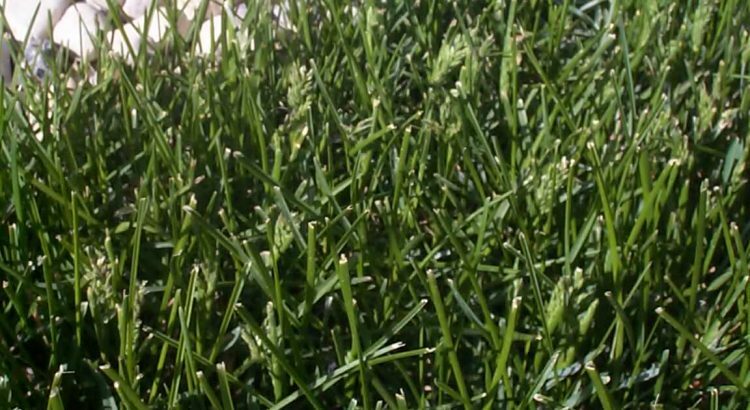 It’s important to note that fertilizing in early spring isn’t necessary and can even cause problems. Allow the grass to wake up on it’s own and start growing before applying any fertilizer. The grass will store nutrients in the fall to allow growth in the spring. You did properly winterize, didn’t you? If not, that’s OK, just wait until the grass is actively growing to apply fertilizer in the spring.